Kano, Nigeria – More than 102 people were killed in the bomb explosions at the central mosque in this city, said a hospital worker. A mortuary attendant at the Murtala specialist hospital Kano, Malam Isa Labaran, on Saturday told Associated Press that he counted over 102 dead bodies deposited inside the mortuary on Friday after the multiple explosions at the mosque. “I was asked to be counting those deposited and I counted over 102 dead bodies before I was asked to stop,” he said. The death toll is higher because more bodies were taken to the Nassarawa hospital, said Labaran. Hundreds had gathered in the mosque Friday to listen to a sermon in a region terrorized by attacks from the extremist group Boko Haram. Multiple explosions ripped through the mosque. Witnesses said heavy smoke could be seen billowing in the sky from a long distance away. Immediately after the blasts, hundreds of angry youths took to the streets in riots, throwing stones, brandishing sticks and shouting at security officials. The palace of the Emir of Kano is near the central mosque. The Emir, one of the highest ranking Islamic figures in Nigeria, is currently out of the country, said palace officials. 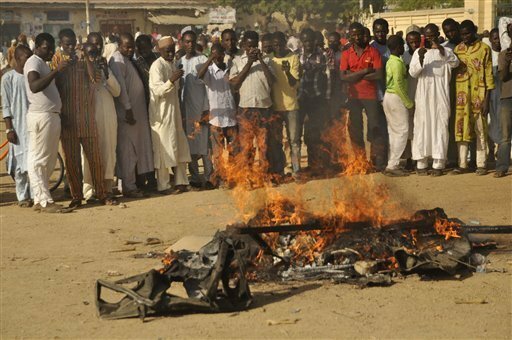 Boko Haram has not claimed responsibility, but the attack bears the hallmarks of the militant group that has carried out numerous such attacks in northern Nigeria, including in Kano. In September, two suicide bombers killed at least 15 students at a government college and in July, five suicide bombings were carried out over the course of a week. More than 1,500 have been killed this year in the insurgency, according to Amnesty International. The attack was condemned by U.N. Secretary-General Ban Ki-moon who called the attack “horrific,” pledged U.N. support for Nigeria’s fight against terrorism, and called for the perpetrators to be swiftly brought to justice, according to his spokesman.